Like every other industry, accounting too has been constantly changing due to rapid technological advancements. In order to compete with the competitors it is important that companies understand the latest trends and implement them in their processes. Many companies are already adopting these trends and reaping the benefits. The latest technological advancements help companies to work more efficiently and effectively. Businesses need to understand that old stereotype and outdated accounting methods are slowly but surely going to edge out. They need to embrace the newer, technologically-advanced processes and be updated with latest trends. Accounting businesses need to be always on the lookout for innovative methods to make their business processes more efficient. In this article we have listed some of the biggest accounting trends and how they are influenced by technology. Cloud computing features help all clients to access all the cloud-based applications to view data and communicate from anywhere. 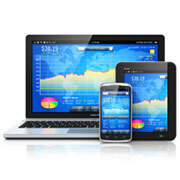 It allows integration of different devices which helps accountants to access client information from anywhere. This integration is also referred to as wide-spread computing which is creating a gateway for CPAs to work more efficiently. More and more accounting businesses are incorporating client portals into their own enterprise systems which enable them to collaborate and share information with customers. This provides the customers with well-organized information that they can access at their own convenience. They can receive analyzed information and also view the different services that are available to them. Tax accounting companies use a lot of important data. It becomes necessary to take the back up of such data so that it can be used in future. Companies are moving on from the old and traditional methods of using tape drives to save data. Technological advancements have helped companies to save their critical data on local and networked drives. These networks are faster and simpler to use and one can be completely assured that the data is completely safe. The usage of mobile devices and smartphones has increased exponentially in the past decade. Companies need to stay updated with the latest mobile developments and adopt mobile accounting practices. Mobile accounting helps in faster service to customers, better response times, and also has better opportunities for revenue growth. The usage of social media platforms for business has increased substantially nowadays. Professional relationships can be initiated and maintained using social media platforms. The traditional method of conducting formal business meetings will slowly give way to online interactions through popular websites such as Facebook, Twitter, or even Skype for face-to-face meetings. Did you like reading our article on the accounting industry trends? Outsource2india has been providing exceptional accounting services and a plethora of other financial services to clients around the world. Our cost-efficient services help our clients save time while receiving access to some of the best talent which we can provide. We follow strict confidentiality agreements and you can be assured that the data you share with us is safeguarded properly. If you are looking for a reliable accounting service providers then look no further. Write to us or talk to one of our representatives and we will be more than happy to help you.